Simeon, Charles Ostrom was the eldest son of Gideon Turner Ostrom and his wife Emma Turner. Born into a family of thirteen children in Clarke Township, Durham County on April 14th, 1859 he was of Dutch and English heritage. The census of 1871 shows the family to be living in Peterboro County, Otonabee Township. From what I can interpret from the census and the map of the area they would have lived closer to Rice Lake and most likely in one of the little towns. Possibly Keene. His father Gideon was listed as a labourer and most of the neighbours have either that as an occupation or miller, or cooper. This would indicate that they lived near or in one of the villages. Simeon’s grandparents, Joseph and Martha Turner are listed as farmers so it is possible Gideon worked for them. The family seemed to move around somewhat but eventually settled in Alnwick Township, Northumberland West. They appear in the census for that area, along with Simeon’s brother’s and sisters, Martha, Lucinda, Elizabeth, Emma, Joseph, Matilda, Annie, George, Lillie, William, and Melinda, ranging in age from twenty to two. The two eldest Margaret and Sim had left home by then. The old Thackeray homestead still stands near White’s Road on County Road 9. Both Gideon and his wife are in the little cemetery, which sits across from the farmhouse. According to a fellow genealogist, the Ostrom's homestead would have been further west on County Road 18 past Brooks Road. The house has long been demolished. Sim’s mother was from Yorkshire, England and immigrated to Canada after her birth in 1840. His father Gideon was born in Sidney Township, Hastings County, from a long line of Ostrom’s that can be traced back to Holland after first settling in Dutchess County in New York, before coming to Ontario. Their original name was Van Oosterom. The Ostrom’s were a prolific family. Sim’s Grandfather Simeon W. Ostrom was married twice and had a total of fifteen children. My great grandmother Frances Knight, (Sim’s first wife), also came from a large family of both sisters, brothers and step-sister’s and brothers. At least they had that much in common. Sim married Frances January 29th, 1881, in Cobourg, Ontario. 7717-81(Cobourg) Simeon, Charles OSTRUM, 22, farmer Canada, Haldimand Tp. s/o Gideon Turner OSTRUM & Emma TURNER, married Frances KNIGHT, 23, Canada,Haldimand Tp. d/o Richard & Fanny May KNIGHT, witn: William Thomas COWLING and Elizabeth Rebecca OSTRUM both of Haldimand, 29 January 1881 at Cobourg, Methodist Church of Canada, Rev. T. W. Jeffery. Turner farm near where Simeon was born, his father's farm later near Gore's Landing where Sim grew up and the Knight farm where he met, married and lived for awhile with his inlaws. Sim settled in next door to his in-laws with Frances and in April of 1881 they had a little girl. Her name was Syntha, Emma Alberta but from family knowledge I know she was always called “Bertie”. He listed himself as a farmer in the 1881 census, so I imagine he helped his father-in-law Richard on the family farm in Bowmanton. Richard had been a tailor, but purchased land in Bowmanton and farmed for years as well as being the postmaster for the little hamlet. This might have influenced Sim later in his life. Over the next ten years Sim and Frances would move from place to place and have four more children. Frances Gertrude, my grandmother 1883, Hope County, Simeon D. 1884, Hope County, Jane Katherine “Jenny” 1887, Garden Hill, and Florence Victoria May in May of 1890 in Toronto. I am not just sure when Sim left Frances, but it was sometime between September of 1889 April of 1891. He is listed in the 1891 census as living in Halton, and Frances is in Toronto. 004778-90 (Halton) Simon Charles ASTROM, (should read OSTROM), 23, farmer, Rosemont, Ballinafad, s/o Gideon & Emma TURNER, married Sarah CAMPBELL,21, Hillsburg, Ballinafad, d/o James & Annie Mariah CAMPBELL, win; Mrs. GIFFORD and Shirley GIFFORD both of Acton, 29 Oct 1890 at Acton. These are the facts that I have been able to gather. The enumeration for the1891 census in Toronto was done April 24th. Frances was living with her parents and four of her five children. I have not found her son Simeon D. She is listed as married. Simeon, Charles is listed on the 1891 in Halton County, Esquesing Township as married to twenty-two year old Sarah (Campbell) Ostrom. He gives his job as a farm labourer and his age is twenty-three. In reality he is actually thirty-two. Interesting how he reversed the numbers. This census was taken on the 7th day of April of that year just a few days before Sarah would give birth to Nell Ostrom, their first child. The couple is living with her widowed mother Angeline and her six brothers and sisters. Sarah was the oldest in the family. I also find it interesting that his marriage registration changed his last name and that of his parents. Almost like he did not want any legal documents that properly identified him. Just a few weeks later his first wife Frances would bury Victoria May born in May of 1990. One wonders what went wrong. It does not appear that Frances was aware of what was going on but if she was, she kept silent. In those days it was not uncommon for men to travel looking for work. Perhaps this is what Sim did. When he did not return, she must have thought him to have come to some demise, when in fact he had just moved on, taken a new life and a new wife. Simeon, who now used his second name, Charles, or Charlie moved out west in 1891, with Sarah "Rose" and little Nell. 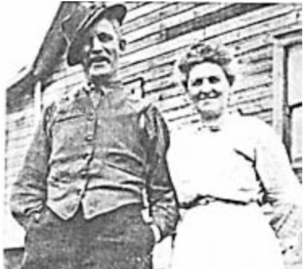 He settled in Alberta as a homesteader near what would be South Calgary today. He and his new family settled in the Elbow River School District No. 999. The area was formed in 1905 by Bruce Long, Joe Robinson, and Keys Cullen. Charlie was the Secretary, Treasurer and tax collector. Elbow River was considered to be part of the Springbank district. The exact location of the Ostrom farm was S.W. 17-24-5-5. This would be what would now be part of the While they constructed their home they lived with the Long family. The land on which they built was purchased from the C. P. R. in 1897 for three dollars an acre. The original dug well was not enough to supply enough water so for a time they were forced to gather water from local streams until in 1908 when they had a new drilled well installed at a depth of one hundred and ten feet. Like in most settlements at that time, bartering was used. Someone would loan a tool in trade for a job the other person could provide. It was that way they were able to manage as the work was hard and the days long. The school the children attended was typical of the time and the students formed a community each participating to help create a good environment for all. Lunches were sometimes supplemented by soup, warmed up on the wood stove. The school featured two small outhouses at the back of the playground. The Elbow Valley’s tight knit community held Christmas concerts in their little hall where everyone was encouraged to participate. Charlie worked as a carpenter in Ontario at some point, which led to his employment building wood pumps when he first settled in the West. 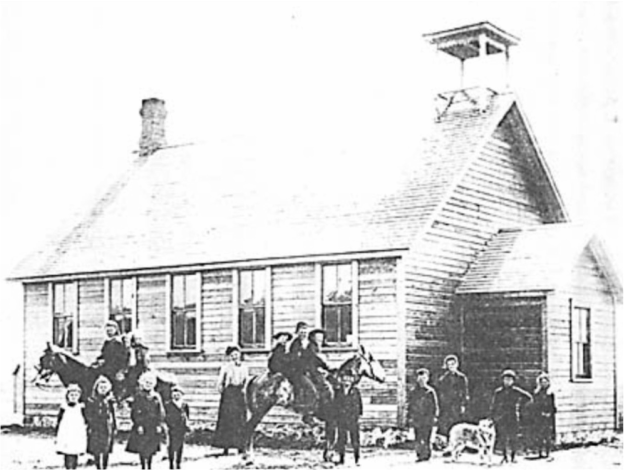 By 1905 the couple had four children all enrolled in the local one room school and one little one still at home. Bessie (white smock) and Annie Ostrom beside her Fred in front of horse on right and Nell behind the dog. On November 1st ,1905 the first day it opened Charlie became the postmaster for Elbow Valley. This was the closest post office to the west of Calgary. Charlie designated part of the kitchen of his house to house the Post Office. This would have been similar to the post office in Bowmanton, when he was with Frances. A sign placed on the gate of his home at the side of the road told everyone where they could fetch their parcels and letters. The local cabinet maker by the name of Quayle built a special desk to suit the needs of the Postmaster. Apparently it was three feet by six feet and featured a row of cubbyholes across the top. Beneath that was a shelf and below a writing area. There was a cupboard underneath that housed the postal notes, stamps and record books. Mail was sorted and placed in the cubbyholes provided for the families of Springbank. At the time a first class letter sported a two cent stamp. With the development of the West came many transient workers and these men received their pay through the mail. This put the postmaster and his family at risk of robberies. There was a story that one time Mrs. Ostrom entered the kitchen of her house after working outside and was accosted by a man rooting through the mail. When told to stop he produced a gun and demanded his mail. Fortunately nothing came of it when one of Charlie’s daughter’s appeared with the family dog the man startled and ran away. The Post office was closed for a period of three months in 1910 when the entire Ostrom family was struck with smallpox. At that time the mail was diverted to the Springbank office. A common treatment for the sores was cow's cream, and according to a family member it was used and proved successful. Each year when the Eaton’s catalogue arrived it created a stir in Elbow Valley. This was the beginning of an onslaught of mail in the Ostrom’s little house. Everything from toys and clothing to medicine and machinery could be mail ordered at that time. Being a postmaster did not take Charlie away from his daily chores so the office was, again like in his father-in-laws in Bowmanton, manned by his wife or one of the girls. When the mail carrier would arrive from Jumping Pond at noon a hot meal was served to him by Mrs. Ostrom at a cost of twenty-five cents. According to the local lore she used the money she saved to buy herself a rocking chair. The family reported that Charlie was often trying to find new money making schemes. In 1913 he bought a lot of Aladdin lamps and sold them to neighbours. The post office closed the last day of July in 1916. One of the important developments in their community was the gravity feed, to bring water to the people of the area. Charie’s sons, Fred worked on that line in 1907 at fifty-cents an hour. It created employment for upward of one hundred men. Fred would join the 137 Battalion C. E. F. in 1916, later to be transferred to th 31 Battalion C. E. F. He went overseas only to return in December o 1918. The Spanish Flu hit Elbow River in 1818 with a vengeance. None of the Ostroms were taken by the disease. Charles wife Sarah Rose took ill in 1920. She was taken to the local hospital for an operation but developed pneumonia and died in March of the same years. After her death a woman by the name of Mrs. Coutts came in to help with the younger children and brought with her two children of her own. There were several others that took her place over a period of time until sometime between the death of Rose and 1923 Charlie married Florence Collins. By this time Charles and Rose’s youngest would have been 17 but they had all left home by the time he married Florence. Charlie and Florence would have three girls and a boy during their marriage. Dorothy May was born in 1924 and Joyce in 1929. I do not have the dates for the other two William and Irene. Simeon Charles Ostrom died April 12th ,1942 in Calgary Alberta. Some of my beginning information was thanks to Bill Smith when I began my Ostrom quest.